To find a domain simply insert or copy and paste the domain name into the input box located in the dashboard. All the emails found in the Domain Search are publicly sourced from the web. Click the arrow next to the number of available sources to expand them. All links are active and they will lead you to the specific page where Hunter found a specific email by providing a reference date too. You can filter Generic or Personal email addresses before or after processing a Domain Search. Generic email addresses are role-based email addresses, like contact@ or support@. Personal email addresses are the professional email addresses of the people inside the organization, like elonmusk@spacex.com. 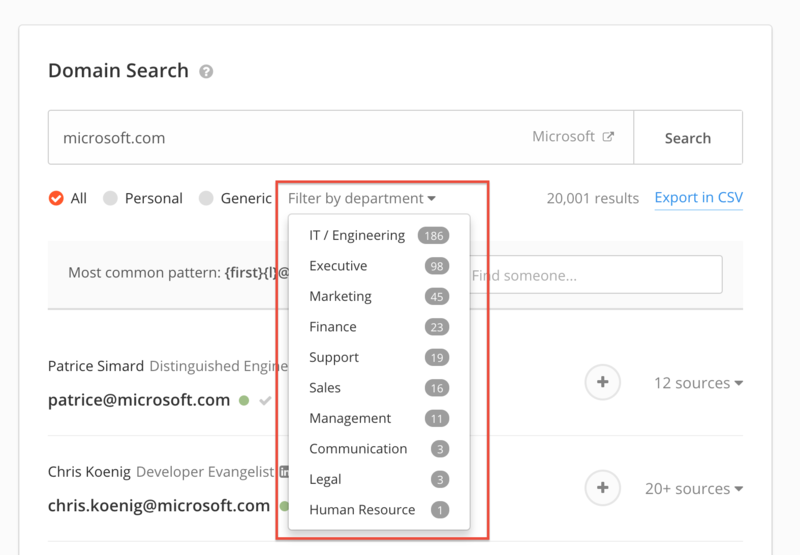 With the department filter you can find the emails for people associated with a specific position in a company. After launching a Domain Search simply choose one or multiple seniority levels and departments you want to find the emails for. simply hit the search icon of press Enter to retrieve the email address for that person along with the list of sources and confidence score. 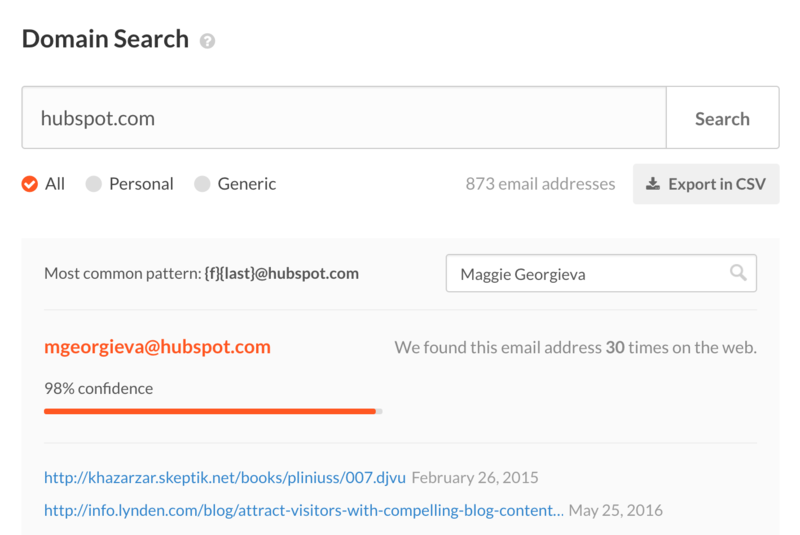 Every email address in the Domain Search is provided with a Confidence Score. Each email address can show a green, orange or red dot next to it. 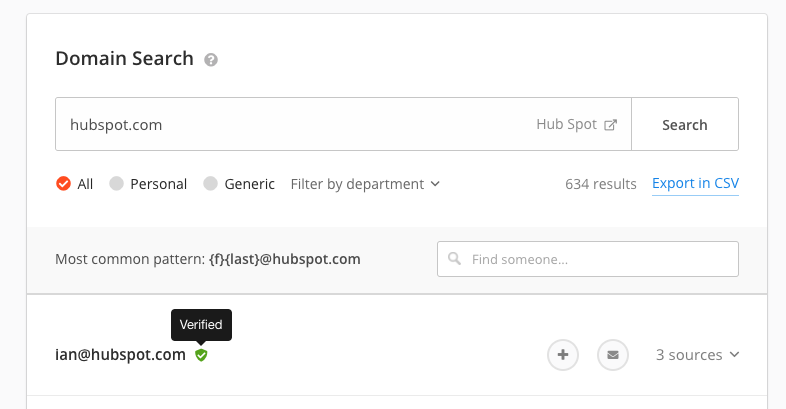 These dots are a good indicator for the deliverability of the email and, by hovering it, you’ll get the accurate % of the Confidence Score. Emails with a confidence score of 95% or higher have a high chance of being fully deliverable although a high score does not guarantee a 100% fully deliverable email. The confidence score depends on the amount of information we have on a domain name and the sources for the email. Paid plan users can use the “Export in CSV” button to export the emails found for a Domain.